We were introduced to the original Annie Chun's Seaweed snacks over the holidays--and are pretty excited to try some of the new Annie Chun's Seaweed Crisps being released soon. Seaweed based snacks have been common in the Korean diet for centuries--and Annie Chun's offers us the opportunity to bring this healthy snack to our families in a variety of unique flavors and varieties. On Sunday, February 15, select Columbus area Giant Eagle stores are hosting a sampling event for Annie Chun's new Seaweed Crisps and Bibigo Gochujang sauce. These products have not yet launched nationally--but, Giant Eagle shoppers can get the first taste at these samplings. Although not yet available nationwide, all 3 varieties of Annie Chun's Seaweed Crisps (original, cinnamon, and gochujang flavors) will be available for purchase at select Giant Eagle stores! We also have an opportunity for three readers to win 3 bags of Annie Chun's Seaweed Crisps in the giveaway at the end of this post! Why Seaweed snacks? The roasted, Korean Seaweed used in Annie Chun's Seaweed products is loaded with vitamins, minerals--and low in calories. Asian cultures--and really many cultures with ready access to the sea--eat seaweed frequently and praise it's health and nutritional values. Annie Chun's Seaweed crisps are available original, cinnamon, and the sweet and savory flavor of Gochujang sauce. Gochujang is a traditional Korean fermented hot pepper sauce which offers a delicious blend of sweetness with savory spices. I am really excited to sample the Annie Chun's Gochujang Seaweed crisps during the product sampling on Sunday, February 15, at participating, Columbus area Giant Eagle stores. I am also pretty excited that the Gochujang flavor is one of the flavors offered in our giveaway packs! Would you like to try Annie Chun's Seaweed Crisps? 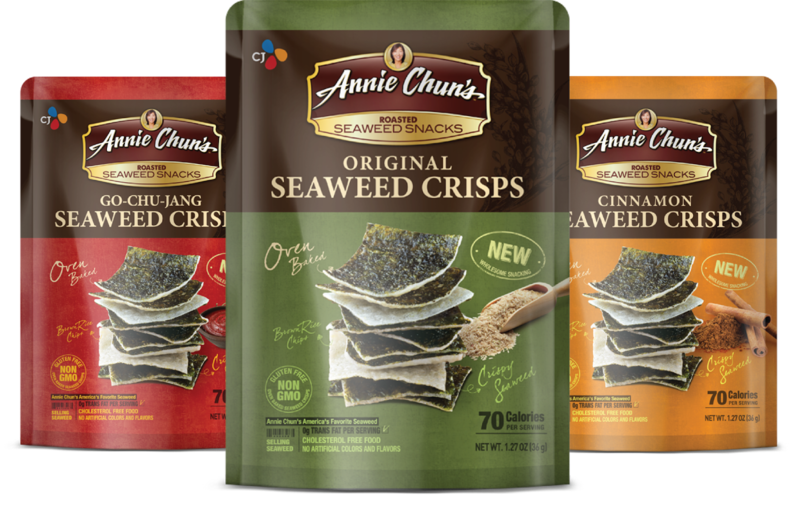 Enter for a chance to win 3 bags of Annie Chun's Seaweed Crisps. We will select 3 winners to each win 3 bags of Annie Chun's Seaweed Crisps. Each prize pack will include 1 Bag of Original, 1 Bag of Cinnamon, and 1 Bag of the new Gochujang flavors. I have never had them, but the original flavor looks really good. I haven't tried the seaweed snacks, but I practically lived off the soups for work lunches this past winter. No, I have not tried Annie Chun's Seaweed snacks. I have tried some other Annie Chun products, but I have never tried the seaweed snacks. I haven't, but I've had seaweed snacks before and I LOVE them, so trying Annie Chun's sounds fun! I never tried these before but I love Annie Chuns and seaweed! I haven't tried them before but i would really like to. These sound awesome and like a snack I would really enjoy! Thanks for the chance to win! We haven't tried them before but I think we'd like the Gochujang flavor! I have not tried these yet, but they sound great. I haven't tried them but the Cinnamon ones look interesting! I have never tried these before. I have not tried these before. I've never tried them before. I have not tried them before but I would love to try the new Gochujang flavor!! I most want to try the cinnamon flavor. Before this post, I had not heard of this product at all. I have not tried them, never even saw them before. I have never tried them but I would love to some day. i have not tried them yet! No, I haven't but I'd like to try them. I have not yet tried these snacks. I've never tried them! I think I'd like the cinnamon flavor best, though. I have never tried them. I've never tried any seaweed snacks before.